This page is for people who are interested in the Rubik's Cube, and other Rubik's puzzles. I've been interested in the Cube and other puzzles since June of 1998 and I still love doing them. I enjoy speed solving for all my puzzles, especially the Rubik's Cube. If you enjoy the cube or other Rubik-like puzzles then I invite you to browse my site. I hope you enjoy it. 2007 Rubik's Cube World Championships in Budapest, Hungary. You can see all my competition results at WCA sanctioned tournaments. Sport stacking video Me performing the cycle in 10.23 seconds. 3x3x3 solved blindfolded in 18.50 seconds I took approximately 1 hour and 54 minutes to memorize the cube and plan through my entire solution. I was then able to solve it in 18.50 seconds while blindfolded. I did not do any moves on the cube during the planning phase. Sport stacking is another dexterity thing that I've gotten into that is a lot of fun. Basically you stack specially designed cups into pyramids through a specific sequence, and then unstack them. Sound easy? Give it a shot, it's harder to get fast than you'd think! To get an idea of what sport stacking is, check out Emily Fox's world record video on superhandz.com. I've been sport stacking since 2003, and below are my records for the 3-6-3 stack and the cycle (the same sequence that Emily does in her video). See my personal records page for the times in my average and also my cube records. Click on the colored nodules below to navigate my site. Speed Solving Video A video of me solving the rubik's cube in 17.88 seconds, with music! Speed memorization How to memorize various sized Rubik's cubes quickly for use in blindfolded cubing. My competition tutorial If you have never been to a competition, and would like to know what to do when, etc.. then this is the tutorial for you. ZB methodInformation and algorithms for learning the ZB method. Fridrich two look last layer 3x3x3 solution 2 look 3rd layer algs I used to average sub-18. Includes finger trick notation. PLL page to be updated soon. Solution page to my extended cross F2L method Description of my new approach to the first two layers. Includes interactive cubes with samples and tips. Beginner/Intermediate solution to the Rubik's Revenge Tired of seeing your 4x4x4 scrambled? Well click here to Solve It! Advanced solution to the Rubik's Revenge Learn how to really speed solve on the Revenge and got some very fast times. Number of possible combinations to the n x n x n cube An explicit formula for the number of combinations to the n x n x n cube. How to convert algorithms in your head Tutorials on how to reflect/invert and reflect/etc. algorithms in your head without writing anything down. All about BIG Cubes Learn all about BIG cubes (6x6x6 and larger) Basic info, where to play with a BIG cube and best of all *still in the works* how to solve a BIG cube of absolutely any size! Unofficial World Records Page Compare your fastest time with people all of the world for any rubik puzzle! Speed Solving Rubik's Cube Yahoo! Group all about speed solving. Trade tips and hints with others or learn how. How to get faster So you're stuck at that 30-60 second barrier, well here's some info on how to get faster. Developing speedcubing methods These methods have all been published around 2003 and represent the lastest developments in speedcubing. Most of them are still being learned by speedcubers and are still undergoing changes or developing variations. NCSSM Rubik's Cube competition The results from a speed solving competition I held at my school (May 2001). Want to try out your cubing skills? Click in the window below to play with the cube. Macky's cube page Macky is one of the best in the world for speedsolving and blindfolded solving. This page is a great resource if you're looking to learn more about the cube. 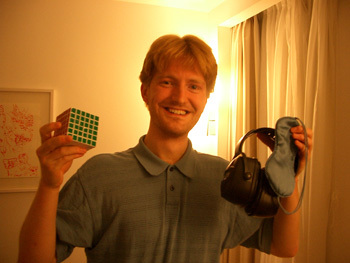 Lars Vandenbergh's CubeZone Lots of information about advanced speedcubing methods. Lars is also the current European 3x3 champion and square-1 world champion. Jess Bonde's Cube Page Cool graphics and some funny cube pictures. Also a very nice timer for taking your averages. Worth a look. Speed Solving Rubik's Cube Yahoo! Group about the cube. Meet some great people, talk about the cube, all kinds of stuff. Lars Petrus' Cube PageA speed solve solution that breaks from the usual layer-by-layer method. Definately worth a look. Gliding Cube A very nice cube program, supports any cuboid up to 10x10x10 cube. It also allows you some very cool move capabilities which creates a very different type of puzzle! Worth a try! Cube Explorer and Cube Optimizer This is an awesome program for finding the shortest way to solve the cube from any position. I scrambled my cube over 250 moves and this program solved it in 19 moves! It also runs extremely fast so you don't have to wait to see the move. I really recommend downloading this program. Rubik Online The Official Rubik Page created by Erno Rubik. Lots of online Java puzzles and an online cube. Here are some various methods for solving the Rubik's Cube. Jo�l van Noort's solution This method is what we math people like to call a commutater based method. Even if you don't know anything about commutaters, all you need to know is that this method is the easiest type of method to learn if you have never tried to solve a cube before. This method will be a bit slower in practice than Jasmine's beginner method (below), but will be, in my opinion, easier to learn. His method for the last layer uses one simple process that is easy to learn (commutaters), rather than a number of different move sequences that you will be required to memorize. If you are interested in speedcubing I highly recommend starting off with Jasmine Lee's method, and later moving on to either Fridrich or Petrus (both are extremely fast speedcubing methods). If you just want to know how to solve the cube, and are not too fond of memorizing move sequences, then I highly recommend learning Jo�l's method. Jasmine Lee's solution Excellent solution page with diagrams for each step. If you are intersted in learning a simple beginner's solution that solves the cube quickly, and is expandable to a complete speedcubing solution, then I highly recommend this site. This solution is an excellent start if you know you will later want to be able to solve the cube in under a minute or faster on a consistent basis. As a follow-up to this method I highly recommend either Fridrich or Petrus (both are extremely fast speedcubing methods). How to Solve the Rubik's Cube 2.3 A great site, the one I used to first learn how to solve the cube. I would recommend learning both methods, it helps you learn how to understand the cube better. Blake O'Hare's simple solution This method tackles the cube in layers with minimal moves for memorization. With dedication this method can be memorized in a day, but a few days would be realistic for most. These two methods assume that you solve the first two layers first. Both of these will decrease your times for the third layer. Dan Knights Intermediate speed solve method Great for decreasing your third layer times, but won't make your head explode to learn it. www.speedcubing.com See Ron van Bruchem's extensive lists of algorithms for all steps of the Fridrich method. Lars Petrus' Solution Unconventional speed solve method, does not use a layer by layer approach yet is still very fast. The links below are to methods that are currently or have recently been developed in the speedcubing community. These represent the latest developments in strategy since 2003. Worth a look if you are interested in the developments of speedcubing techniques. Gilles Roux's method This method is a recent development that is proven to be very fast. Gilles averages 15.08 seconds using this method. The strategy is to build a 3x2x1 block on one side of the cube, as well as on the opposite side. This leaves only the top and middle layer unsolved. You then solve the orientation and position of the corners, and finally you solve the last 6 edges and the centers. There are a number of people learning this method, and it has already been proven to be very, very fast. Ryan Heise's method This is a variation on the Lars Petrus speedsolving approach. In this method you start by solving the first two layers minus one corner edge pair. Then you solve the middle layer edge, a 3x2x1 block in the last layer and its opposite edge. You finish off with the last three corners. The first step allows for a surprising amount of freedom during the solve, allowing many opportunities for efficient speedsolves. The third step is explained in terms of commutators and conjugates, rather than requiring the memorization of many different sequences. These types of sequences are already proven to be efficient and more importantly fast during speedsolving. Andy Camann is currently studying a variation on this method if you have any questions relating to this style of solving. Duncan Dicks' L2L(1-4) methods This method is an extension and variation on the keyhole method. There are 4 substeps to be learned, each can be learned individually without knowledge of the others and provide a fast method, or all of them can be learned for the most advanced version of the method. The goal is to learn the 4th substep, but knowledge of all the substeps would allow for the choice of the best startegy based on the given scramble. The strategy changes for each substep, but the overall strategy is to break up the F2L solve into various steps making sure to always perform useful affects on the last layer at each F2L step. This makes the F2L solve longer than a Fridrich style solve, but it drastically shortens the LL solve by building it and the F2L at the same time. The average number of moves for the L2L4 strategy is 53-55, which is about the same as Fridrich. 53 algorithms are required for the most advanced L2L4 version. This method also includes useful variations for the ZB method (see below). Zborowski-Bruchem (ZB) method This is the method I am learning and works to affect the last layer while finishing the F2L. In this method you solve the cross and 3 corner/edge pairs. While solving the last corner edge pair you also orient the edges of the last layer. The final step solves the rest, or orients corners and permutes all pieces in one algoritm. This method averages less than 50 moves in speedsolving, however the minimum number of algs required for the whole method is 158 (306 with reflections and inverses) for the F2L step and 270 (493 with reflections and inverses) for a total of 428 (799 with reflections and inverses). This may seem staggering, but a few people have already started learning it. Ron van Bruchem, Zbigniew Zborowski, Lars Vandenbergh, Dan Harris, and myself are all learning this method if you have any questions about it. Vandenbergh-Harris method This method is a variation on ZB, and is a useful stepping stone for learning the whole method. In this method you solve the F2L minus one corner/edge pair. You then pair up and insert the final pair such that the last layer edges are oriented correctly. You finish with a COLL alg (orient and solve corners of last layer while preserving edge orientation) and an edge permutation. The advantages of this method are that it starts getting you used to ZBF2L (ZB first two layers) techniques and for the last layer you have a 1/12 chance of skipping the edge permutation after COLL. Vandenbergh-Harris variation 1 In this variation you learn the first two layers approach of ZB (ZBF2L) instead of first pairing up the corner edge pair and then inserting it such as to correctly orient the last layer edges. I currently average 22-23 seconds with this method, and have averaged sub-20 with it a few times. The disadvantage of this method is that you have to learn 158 algorithms (306 counting reflections), however the advantage is that it is a significant step towards learning the entire ZB method. Lars Vandenbergh and Zbigniew Zborowski also have extensive pages on the ZBF2L. Vandenbergh-Harris variation 2 In this variation you continue to pair up and insert the final corner edge pair such that all last layer edges are oriented correctly, however instead of using COLL/PLL to finish, you use the ZB last layer technique. Dan Harris is currently learning this method as a means to learn ZB. The disadvantages to this method are that you have to learn 270 (493 with reflections) algorithms, but the major advantage is that this method requires learning a huge chunk of the ZB method algorithms. Learning this variation is a significant step towards learning all of ZB. In addition to Dan's site you can also view my site on the ZBLL algs. Cube Explorer and Cube Optimizer This program will help you find the shortest possible algorithm for any effect on the cube, including solving. This program can routinely solve your cube in under 20 moves. *Note* you have to download and install this program. Rubix Repair This online cube solver allows you to enter the colors on your cube and see a 3D representation so you can double check. This program solve the cube in 100 moves or less depending on how you set it. Dan Knights' Java Applet This solve your cube in 50-60 if you choose the short solution or around 70-80 for the long solution. It also shows you the moves being done, and does them one at a time so you can follow along at any pace. Gliding Cube This applet is very smooth and has excellent graphics. Supports any cuboid up to 10x10x10. It also adds some VERY interesting move capabilities. A very cool new puzzle can be formed! Give it a try! Ron's Online Timer Very useful. Counts down examination time before you start and times you as you go. You can also vary the examination time beforehand from 1 sec to 15 seconds. Simply hit spacebar to start and stop. If you speed cube then this timer is very helpful. Dan Knights' Java Applet created by Dan Knights : Play with a scrambled cube, enter you own type of cube with any color combination to play with. Enter your own cube to play with or have solved for you, or to be shown how to solve. A very nice applet, definately worth a visit! 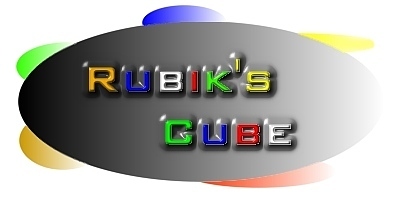 Rubik's Online - Online Cube: Java Cube applet from the Official Rubik's site. Rubik's Cube Java Applet created by Michael Schubart: Really nice 3x3x3 cube applet. It's easy to use and has a hall of fame if you can solve it. Virtual Reality Magic Cube created by Michael Chang: Very nice graphics. Has 2x2x2, 3x3x3, 4x4x4, 5x5x5, and 6x6x6! Virtual Cube created by Song Li: 3x3x3 Rubik's Cube applet. Website created by Chris Hardwick. If you have any questions, move suggestions for different cubes, record times that you'd like to share, suggestions, criticisms, questions about where to get Rubik's and other puzzle products, or any other thing you'd like to address then e-mail me. I'll be glad to answer any questions that you might have.